If you have a need of a high degree of security with unmanned control and are looking to secure the outer perimeter or an areas within your site, then Willings has the products and expertise to help. 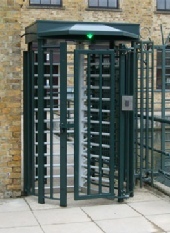 Our range of Full-Height Turnstiles consist of a series of manufacturers such as; The Automatic Systems TR range of high security but elegant perimeter security turnstiles to the Tonali’s high security booths and revolving doors with higher aesthetics and more suited to internal or semi-external applications. standards. In addition to providing the best equipment Willings offers a design capability to help you select the most appropriate solution. Professional, experienced project management team with specialist knowledge of demanding site conditions. A specialist installation team used to working in disciplined and challenging environments and a after sales support with extended warranty to maintain our products to their highest standards. All our full height turnstiles have heavy duty head mechanisms with continuously rated solenoids designed for high usage. The 120 Degrees 3-arm full-height turnstile offers a high level of security and a comfortable space for the user whilst the 90 Degree 4-arm turnstiles provides increased security.